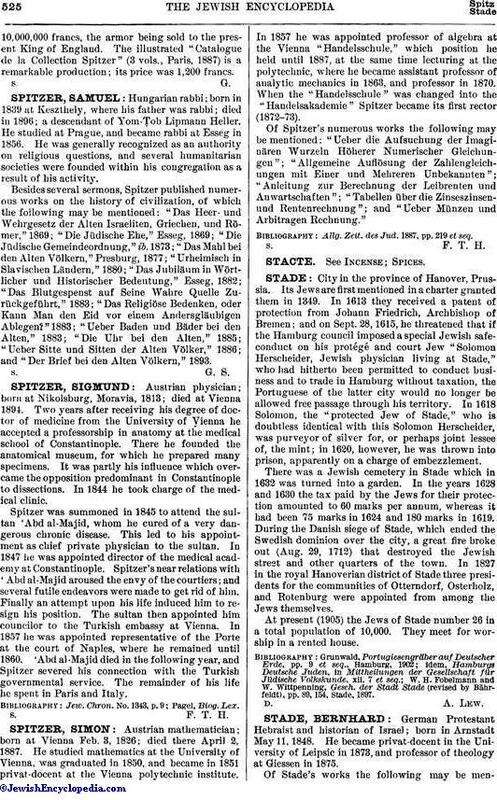 Austrian physician; born at Nikolsburg, Moravia, 1813; died at Vienna 1894. Two years after receiving his degree of doctor of medicine from the University of Vienna he accepted a professorship in anatomy at the medical school of Constantinople. There he founded the anatomical museum, for which he prepared many specimens. It was partly his influence which overcame the opposition predominant in Constantinople to dissections. In 1844 he took charge of the medical clinic. Spitzer was summoned in 1845 to attend the sultan 'Abd al-Majid, whom he cured of a very dangerous chronic disease. This led to his appointment as chief private physician to the sultan. In 1847 he was appointed director of the medical academy at Constantinople. Spitzer's near relations with 'Abd al-Majid aroused the envy of the courtiers; and several futile endeavors were made to get rid of him. Finally an attempt upon his life induced him to resign his position. The sultan then appointed him councilor to the Turkish embassy at Vienna. In 1857 he was appointed representative of the Porte at the court of Naples, where he remained until 1860. 'Abd al-Majid died in the following year, and Spitzer severed his connection with the Turkish governmental service. The remainder of his life he spent in Paris and Italy.